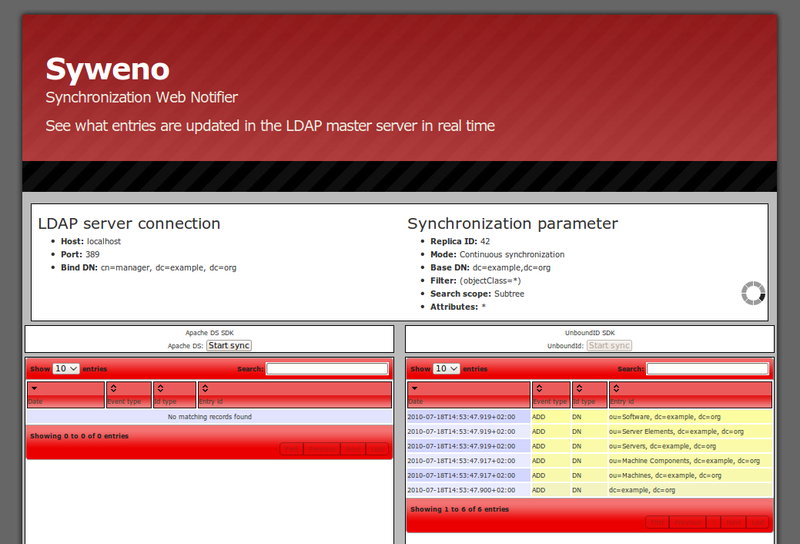 As you may know, I’m rather fond of the LDAP protocol and its open source server and client implementations. But I’m also found of the JVM, and in a not so far past, the only maintained Java LDAP SDK was Sun’s LDAP-JNDI, which is at best a call for masochists to make them fulfil their perversions. But that time seems to be far behind, and the Java-LDAP world evolved a lot in the last 5 years, with the creation of two open source LDAP servers fully built in Java (Open DS and Apache DS), the Spring framework sub-project Spring-LDAP, more recently the really good and already mature UnboundID LDAP SDK and finally the ongoing effort from OpenDS/ApacheDS teams to make a new reference Java LDAP API. That’s nice, because LDAP server implementations are quite mature and really efficient NoSQL stores, in production in the biggest companies, in critical spots. But LDAP is also a really well thought-out protocol, and it’s normalized – something generally missing for other NoSQL stores, and something of much importance: it brings interoperability. OK, that was just a little context to introduce my latest toy application. NoSQL stores are (most of the time) associated with the idea of replication. Until rather recently, replication was a black point in the open source LDAP world, were no real standard had emerged for that need. Each server implementation was using its own proprietary protocol, if replication was available at all. But lately, it seems that OpenLDAP’s replication implementation, SyncRepl is starting to become the defacto standard: ApacheDS chose to use it for it’s own needs. And that move was possible because, like almost everything in LDAP, SyncRepl is just an extension to the LDAP protocol, normalized in RFC 4533. ApacheDS’ adoption of SyncRepl is a major news. It means that it opens the way to cross-LDAP server master-master replication, and an even stronger and integrated open source LDAP ecosystem. But also, it becomes really interesting for third-party clients to use SyncRepl for their read-only synchronization needs. For example, it becomes trivial for an email client to replicate only a sub-part of the LDAP directory which contains contact information and only choose what attributes are needed – but also to stay synchronized with any of their future evolution. The two SDKs are ApacheDS’ API, since their server uses SyncRepl for its replication system, and Unbound ID’s LDAP SDK which added it less than ten days ago (ok, after I asked for it’s availability, but the implementation was really fast: thank you Neil Wilson for your hard and great work). And for things to be really trivial for a client, the best is to have a working example available. It’s what I propose with the following show case application: Syncrepl Web Notifier, in short: Syweno. build a little client application that uses that API and visually demonstrates how it works. A web page that allow to start/stop a synchronization and display in real time updates made in the LDAP master is a good candidate. Ah, and before you look at the code of Syweno and start to ask if you just forgot even basic Java syntax, don’t be afraid: it’s coded in Scala (and yes, that runs on the JVM, see the README.txt), using Liftweb framework – Comet is so easy to use with it, it’s not even fun. Does this support delta-syncrepl? It would be nice to see something like this with that support as well. Sync-Repl aka RFC 4533 is not a standard. It’s a published document that describe some Experimental work. IMO, Sync-Repl is not a complete solution, and that’s why Delta-SyncRepl was introduced in OpenLDAP. As you’ve said yourself, you don’t know how Delta-SyncRepl works. As a matter of fact, it’s completely unspecified. The only thing that exist is C code.